Some members of the Lodge Concord which meets in Glasgow, after enjoying a bottle of single malt. I had the pleasure of being invited to a Welsh lodge over the weekend; St. Deiniol’s Lodge No. 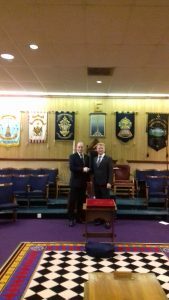 3273, for the installation of the new Worshipful Master. 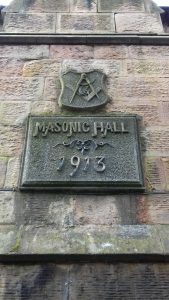 St. Deiniol’s is a historic lodge, being founded in 1907 and meets in a beautiful sandstone Masonic Hall that was opened in 1913. I had actually taken a photo of the Hall which was published in my second book The Transformation of Freemasonry, and it was great to come back and finally visit a lodge that meets in the building. The lodge itself uses a ritual that is a blend of Bottomley and Nigerian, and at every Installation, the lodge is visited by a Scottish contingent from a number of lodges north of the border. It’s great how certain lodges create relationships with other lodges and visit each other, making the lodge meeting a bit more special. The Masonic Hall, which was originally a school house built in the late 19th century, is well worth a visit and has the best Masonic museum I’ve seen outside of London, and being set in such a historic and beautiful part of North-Wales, it made the visit a unique and memorable experience.